Those guys at the CSIRO and Bureau of Meteorology [BOM] are fun and wacky guys; they keep saying things which their own data contradicts! Their 2011 climate report showed that. 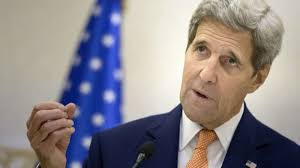 Now they have done it again in their follow up to their much beloved State of the Climate, part 1, part 11. The highlights of part 11 are here and the whole fun-filled effort is here. Are they up to their old tricks? They say atmospheric concentrations of CO2 are the highest in 800,000 years. They rely on ice-core records to claim this. The definitive paper on ice-core based records of CO2 over the last 800,000 years is by Luthi et al. Luthi looks at all the ice-core records and generally finds a maximum of 300 parts per million [ppm] for this period. Currently the CSIRO/BOM boys have noted the CO2 concentration is 390ppm. However, Luthi note there are pockets of CO2 concentration which range from 264 and 477 p.p.m. Luthi calls this a “large scattering” but regard it as an outlier from the normal range caused by a defect in the drilling process. But how accurate are the methods used to interpret past concentrations of CO2? Noted ice core expert Professor Zbigniew Jaworowski explains the inherent defects of ice core extraction of CO2 samples here. Basically the pressure of the ice weight can cause the CO2 contained in the ice core to be ‘squeezed’ out of the ice. This has 2 effects. Firstly this leaves less CO2 in the older ice samples creating the impression of less concentration in the past. Secondly, the CO2 squeezed out can pool and give anomalously high readings in other parts of the ice samples; as Luthi found. Another paper which takes this effect into account when looking at the ice record is by Drake. 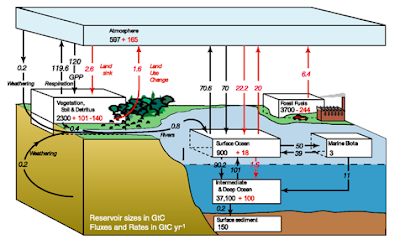 Figure 4 of Drake clearly shows that when adjustment is made for the defects Jaworowski has highlighted prior levels of CO2 were not that different from today. But let’s assume the CSIRO/BOM comment is right and that current CO2 levels are exceptional over the last 800,000 years. What relevance does that have for temperature? 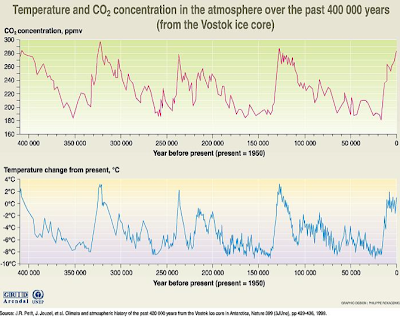 The graph below shows ‘official’ CO2 and temperature over the last 400,000 years. The high-points in the temperature graph show the past short interglacial periods similar to the one we are now in. The temperatures in the previous interglacials are HIGHER than they are today but CO2 levels were LESS than they are today! So, if we accept what the CSIRO/BOM is saying and the record of past CO2 is correct it means LESS CO2 is associated with HIGHER temperatures! In other words the claim by the CSIRO/BOM does not support AGW, it disproves it! 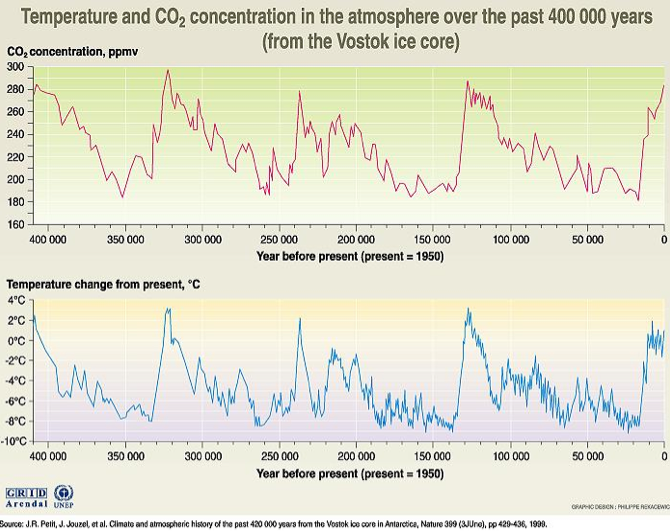 Furthermore, even if current CO2 levels are the highest for 800,000 years there is no certainty that human emissions of CO2 [ACO2] are responsible for all the modern increase. The Knorr paper shows that the % of airborne fraction of ACO2 has not changed in 150 years. A simple calculation shows how ACO2 cannot be responsible for all CO2 increase. If CO2 is 100ppm and ACO2 is 20% or 20ppm then if CO2 doubles to 200ppm ACO2 must be still 20% or 40ppm BUT CO2 from other sources must have increased from 80ppm to 160ppm. 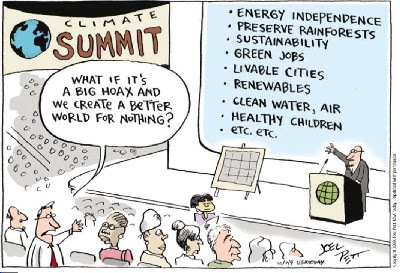 The significance of this is that even if you believe, as the fun guys from CSIRO/BOM do, that CO2 causes global warming, catastrophic climate change and the end of the world, it is likely that the increase in CO2 is not caused by humans! You couldn’t make this up; oh wait, that’s what they’re doing.